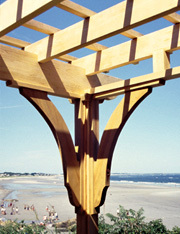 Our Classic Pergola incorporates eight simple, but elegant curved brackets, 6 x 6 posts and caps and two main beams (beams are generally the longest and largest of the structural pieces and sit on top of the posts). The 2 x 6 rafters that run perpendicular to the main beams are notched to fit over the beams. The end rafters nestle into two connector assemblies that are fastened to the posts and brackets. The number of 2 x 2 purlins (the pieces that sit on top of the rafters and run perpendicular to them) can be increased for added shade coverage. Please see our Details/Materials section for more information on the construction of our products and the materials that we use. While the pricing for The Classic Pergola varies as to size and span requirements, generally the cost for this structure is between $45 and $55 per square foot. Specifics that affect the price are density of overhead structure, span distance of main beams and type of attachment to the foundations. The pergola can be attached to existing patios, decks and rooftop terraces or to foundations placed in the ground. Several variables will need to be discussed with you in order to price your Classic Pergola. We will be happy to guide you through these questions. 1. What type of vine, if any, are you going to grow on the structure? 2. What is the pergola going to be used for and how much space is ideal for those functions? 3. If the structure is to be used for shade or privacy, what is the ideal amount and should vines be used in conjunction with the structure to obtain those goals? 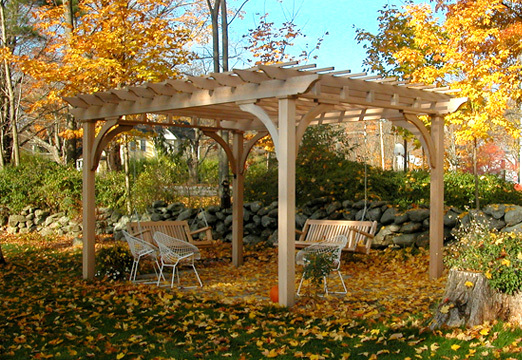 Please call 888-285-4624 with your size requirements and we will be able to quote a price for The Classic Pergola.